Am I The Only One Who Hasn’t Moved On? It seems hard for me to move on from Falling for Innocence this explains why i still go to tumblr everyday and check whether there’s a new post under the Falling for Innocence tag or not. I know that i previously promised to post two or more appreciation posts following this post and i don’t forget that guys. I know it’s been one month already but i’m going to keep my promise, something like JOJ, LIL case won’t happen lol. 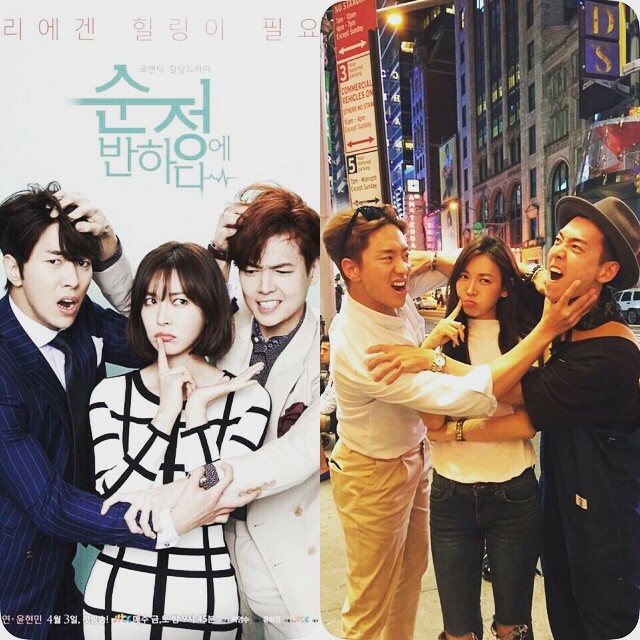 Two weeks ago, the three leads recreated their drama poster in NY! The photo was posted by Jung Kyung Ho and also Yoon Hyun Min on their instagram account (@allallj and @yoonhyunmin). The guys seemed to have holiday together since Yoon Hyun Min posted photos where him and Jung are together in it. I found this cute fanart few days ago on instagram and thank God that insta acc credited the fan who drew this. So i checked her weibo account but unfortunately s/he didn’t post any HD version of his/her fanart. The fanart is the recreation of the closing scene of the series where Kim Soon Jung and Kang Min Ho share sweet kisses on the stairway near Soon Jung’s house. You can find her on her weibo here http://weibo.com/u/2001547483 (also to appreciate her/his work, do like or forward or comment on the original picture) a weibo account is needed though if you want to view the page. And i have a very recommened fanvid of Kang Min Ho to cheer you up. If you’re having a bad day, just watch these videos and you’ll be alright. The videos point out Kang Min Ho’s strongest point which is his hilarity. I included the first part of the video on my review post and two weeks ago finally the uploader uploaded the second video. Idk whether this friend is going to upload the third part i hope s/he will though! Do not watch the video while drinking or eating to prevent thing you do not want to happen. It’s also guaranteed that you will smile ear to ear while watching! It’s an efective way to boost up your mood when you’re having bad day. Try it, it works! Also, if you have time you can vote for your favorite pairing in Kdramaland here http://vote.kdramastars.com/2015-first-half-best-couple-kdrama Vote for your favorite even though i actually want you all to vote for Jung Kyung Ho and Kim So Yeon kkkk. Lat but not the least, I’m so active in blogging this week!!! Horray!!!! Let’s jump in circle and scream at the top of our lungs! !